This study was undertaken to investigate chlorpyrifos (CPF) hepatotoxicity and to assess the hepatoprotective effect of fennel (Foeniculum vulgare) essential oil (FEO) on male rats. The oil was extracted from seeds and analyzed by GC/MS. The two doses of oil (0.3 and 0.5 mlkg-1 b.wt. ), either with or without CPF (1/10 LD50), were administered orally for 28 days. Administration of CPF caused an increase in hepatic cytochrome P450, lipid peroxidation (LPO) and alteration in several serum biomarkers (e.g. alanine aminotransferase (ALT), acid phosphatase (AcP), cholinesterase (ChE), ?-glutamyltransferase (GGT), albumin and total protein). Compared to control values, body weight was decreased, while relative liver weight increased. 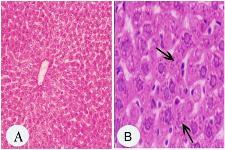 Furthermore, CPF-group showed degenerative changes, mononuclear cell infiltration and focal necrotic cells in the liver. In fennel oil-CPF groups, the aforementioned alterations were alleviated, especially with the higher dose. The antihepatotoxic activity of FEO may be due to its antioxidant activity, ability to scavenge free radical generated by CPF and inhibition of cytochrome P450 and oxon formation. The study clearly indicated that fennel oil has a protective effect against CPF-induced hepatotoxicity.